It looks like a Wrangler, sure, but the Jeep Gladiator combines the Wrangler’s legendary capabilities with best-in-class pickup truck capacities for a completely new rig. (Credit: Aaron Turpen/New Atlas). If American vehicle brands, especially truck makers, have a trope, it’s spouting numbers about their wares. Jeep isn’t any different there, focusing its push for the new Gladiator pickup on phrases like “most capable” and “best-in-class.” It’s hard to blame the firm though, given the extreme capability the 2020 Gladiator claims. The Gladiator might look like a Wrangler, but comparing the puny towing and hauling capabilities of that SUV, the Gladiator is far more truck than it is SUV. 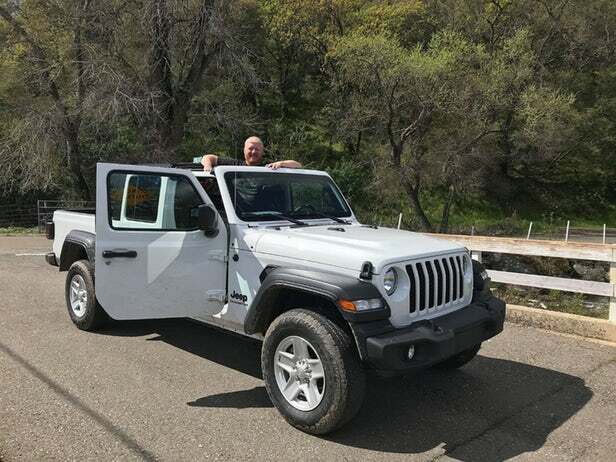 The 2020 Jeep Gladiator is a mid-sized pickup truck, competing against vehicles like the best-selling Toyota Tacoma and the Chevrolet Colorado. The Gladiator can tow up to 7,650 pounds (3,470 kg) and haul up to 1,600 pounds (726 kg) in its bed. Those numbers change some, depending on the trim point chosen, but even the Gladiator Rubicon, which has the lowest towing, can pull 7,000 lb (3,175 kg). That beats even the best-possible towing of the Tacoma by 200 lb (91 kg) and the more comparable Tacoma TRD Pro by 600 lb (272 kg). Hauling capacity for the Gladiator is similarly superior in comparison. Because the Gladiator is a Jeep, however, even its base model is more all-terrain-capable than are most mid-sized trucks from any make. There are four grades of Jeep Gladiator, starting with the Sport and moving through the Sport S, the Overland, and then the Rubicon model. The Gladiator Sport S model, which we drove both on and off the road, has the same clearances, angles, and basic four-wheel drive capability as the more robust-and-ready Rubicon model. All Gladiator models come standard with four-wheel drive and large tires. The Sport and Overland use more road-ready tires with a harder-tread, all-season set whereas the Rubicon has more aggressive all-terrain tires with knobbier tread. 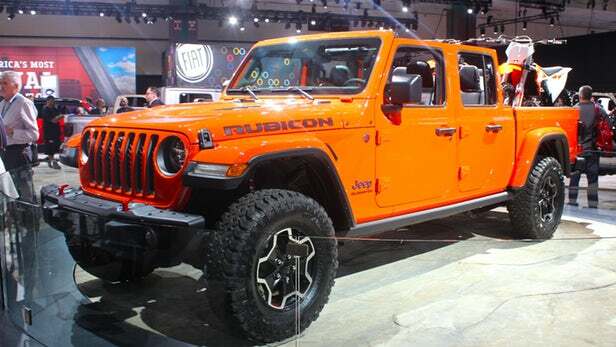 The Rubicon also includes a more aggressive off-road suite of goodies like a disconnecting sway bar, protective gear all around, and a steel front bumper that is tow- and winch-ready. The Gladiator has third-generation Dana axles, Tru-Lock electric axle lockers, and can ford water up to 30 inches in depth. We put a lot of that to the test at an extreme off-road course created by Jeep to showcase the new Gladiator. On that course, we piloted Rubicon and Overland models through mud, dirt, deep puddles, over rocks, and into extremes of articulation and bump-slide control. The Gladiator kept its Jeep name intact despite being bottomed out, scraped, bruised, and smacked against the countryside. Like the Wrangler, the Gladiator is exceedingly astute off the pavement.